Hi Abhisekh, you bear the distinction of being the first person to comment on my blog!! I've a ton of stories but not enough time to post them. I remember hating brinjals as a kid. They used to make my tongue itch - some kind of an allergy, maybe? No-one cared at the time :-D there were far more pressing issues to attend to! Besides, I found the taste most unappealing. Now, I am a convert!! Our local doctor here makes a superb upma. It's the best I have ever eaten in my life. And he puts the large eggplant in it. And peanuts as well!! I have to get hold of his recipe. It's simply out of this world!! Hi Sunny! Thanks for the kind words! I am hoping to have more stuff up here soon - but that is just not happening lately! Oops! Looks like I deleted Sunny's comment by mistake! Sorry, Sunny!! excellent blog... linking you. :) Yikes! I need to go wear the dunce cap for a while. my husband hate brinjals gotta try this one... hope he likes it..
Aparna, good luck!! I know a lot of people who detest brinjals. I think the trick lies in making the masala spicy enough so that they forget that they are eating brinjals! 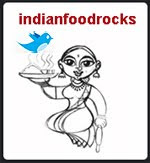 First time in your blog.Really your blog rocks!Great presentation of recipes. Madhuri, welcome! Hope to see you around more! I have visited your blog many times before...but only recently tried out couple of recipes (e.g. To-die-for broiled potatoes....just awesome). Many other are on my list to try out...Thanks for sharing these recipes. Sarika welcome! Oh those potatoes are to-die-for! I make them on a regular basis. Also consider cutting them long, like french fries, and including other roots and tubers like turnips, sweet potatoes, taro. Hope to see you around more!